The book is an essential reference for practicing actuaries and actuarial researchers who want to go beyond the material required for actuarial qualification. 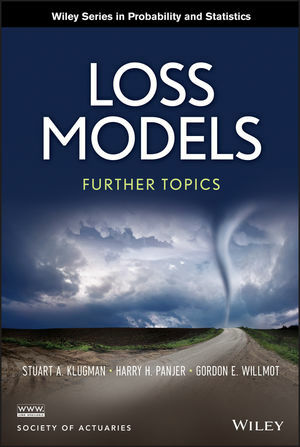 Loss Models: Further Topics is also an excellent resource for graduate students in the actuarial field. STUART A. KLUGMAN, PhD, is Staff Fellow (Education) at the Society of Actuaries and Principal Financial Group Distinguished Professor Emeritus of Actuarial Science at Drake University. Dr. Klugman is a two-time recipient of the Society of Actuaries' Presidential Award. HARRY H. PANJER, PhD, is Distinguished Professor Emeritus in the Department of Statistics and Actuarial Science at the University of Waterloo, Canada. Dr. Panjer was previously president of the Canadian Institute of Actuaries and the Society of Actuaries. GORDON E. WILLMOT, PhD, is Munich Re Chair in Insurance and Professor in the Department of Statistics and Actuarial Science at the University of Waterloo, Canada. Dr. Willmot has authored more than eighty-five articles in the areas of risk theory, queuing theory, distribution theory, and stochastic modeling in insurance.